Is it always a good idea to walk a colicking horse? Q: I understand walking a colicking horse into exhaustion until the vet gets there is not beneficial at all, but what if a horse desperately wants to roll? A: I’m glad that you recognize “walking a horse to death” is not the right thing to do when a horse is colicking. This advice probably stems from the belief that for a mild gas colic, movement may “jiggle” a gas pocket along and help resolve it. Plus, we know that stall confinement is a risk factor for colic. But walking a colicky horse is definitely one of those cases where more is not better. That is, while 10 minutes of easy walking every hour or so might distract both the horse and handler from the abdominal discomfort, hours and hours of walking or worse yet, forced trotting, is not going to help the situation and may actually make it worse. Another reason people might think they need to keep a horse up and walking is because of the long-held and deeply rooted myth that rolling causes the intestines to twist. Think about it: if rolling caused horses’ intestines to shift around or twist, wouldn’t there be A LOT more colics, and surgical colics at that? I’m here to tell you that horses roll BECAUSE they have a twist. That is, they are trying to find a way to relieve abdominal pain that may be due to gas, spasm, impaction, displacement, a twist or even some non-intestinal reason (remember “colic” just means abdominal pain, not necessarily intestinal pain). If the horse lies down and stays there, let him. If the horse occasionally gets up and changes positions, also let him. But if the horse is constantly getting up and down or is rolling frequently, see if he feels more comfortable staying on his feet and walking. Besides giving the horse something else to focus on besides how much his belly aches, walking could actually be a more comfortable position, it could result in less energy expenditure than constantly getting up and down or rolling frequently, and it could potentially prevent a horse from injuring itself by getting cast in a stall, trapping a leg under a fence, or whacking its head and eyes on the ground. Understand that the goal from the time the veterinarian is called until he or she arrives is to keep the horse and handler safe and to encourage the horse to save its strength. Sometimes the best way to accomplish both these goals is to allow the horse to lie down and rest calmly and quietly. 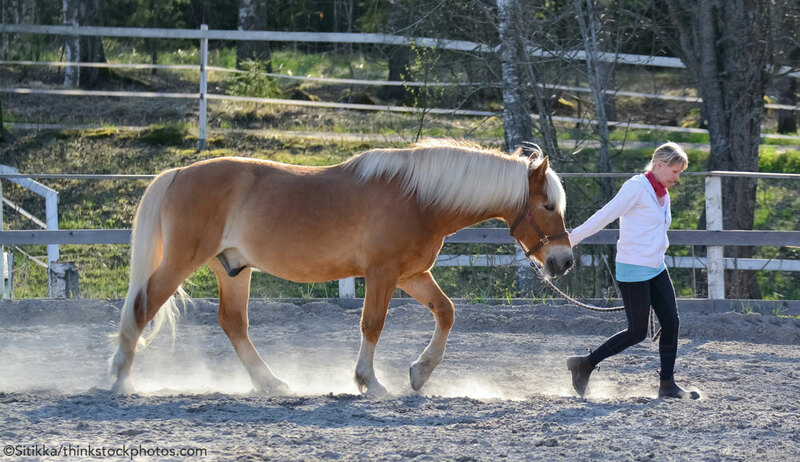 There’s no need to make the horse stay on its feet and certainly no need to force him to walk or trot. And even in certain situations where the horse is violently thrashing, sometimes being forced to stay upright or to move is unsafe for the humans, stressful for the horse, and results in just as much effort being expended by the horse. Get the horse in a safe place like an indoor arena, solid-walled round pen, or large grass pasture. Record the horse’s vital signs as well as specific signs of colic. Remove all food, including hay and grain. Do not force the horse to keep standing or to keep moving. Avoid giving the horse any medication, supplements, or food unless expressly instructed to by your vet. Don’t wait and see if the horse gets better on his own. Please don’t be afraid to call your vet. Believe me, they would rather be called out to a false alarm or to find a horse that feels better than be called out to a horse that’s been colicking all day and all night (or for several days) and have to tell you that it’s too late, nothing can be done, not even surgery at this point. The bottom line is get your vet involved sooner rather than later and leave the excessive activity to the power walkers!